Prepare for high-flying action with the Berserker Bomber, featuring a detachable winged eye, dual 6-stud tech infection shooters and movable wings, plus a detachable Vyro Suit for the MechaByter. Attach the jet pack to Macy and send Berserker flying back to Monstrox! 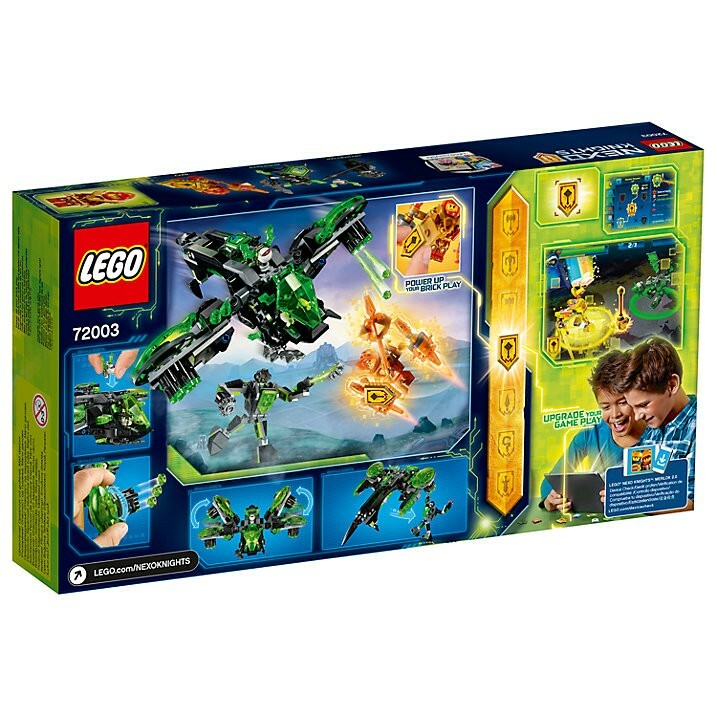 This popular kids toy includes 2 minifigures, a MechaByter figure and 2 scannable shields. 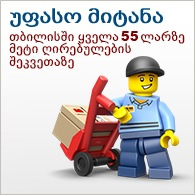 Includes 2 minifigures: Macy and Berserker, plus a MechaByter figure. 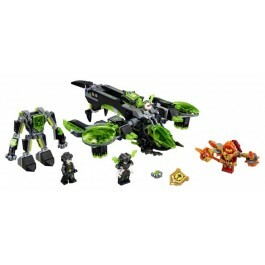 Berserker Bomber features dual 6-stud tech infection shooters, 2 movable wings, detachable eyeball element with translucent-green wings, weapon holders and a shield holder, plus the detachable and posable Vyro Suit with cockpit and 2 critter shooter arms. Weapons include Macy's Mace, Berserker's cleaver and the MechaByter's spear. Also includes The Mace of Merlok shield holder. Detach the Berserker Bomber’s winged eye and chase after Macy! Place the MechaByter in the Vyro Suit, attach it to the base of the Berserker Bomber, and fly into battle. 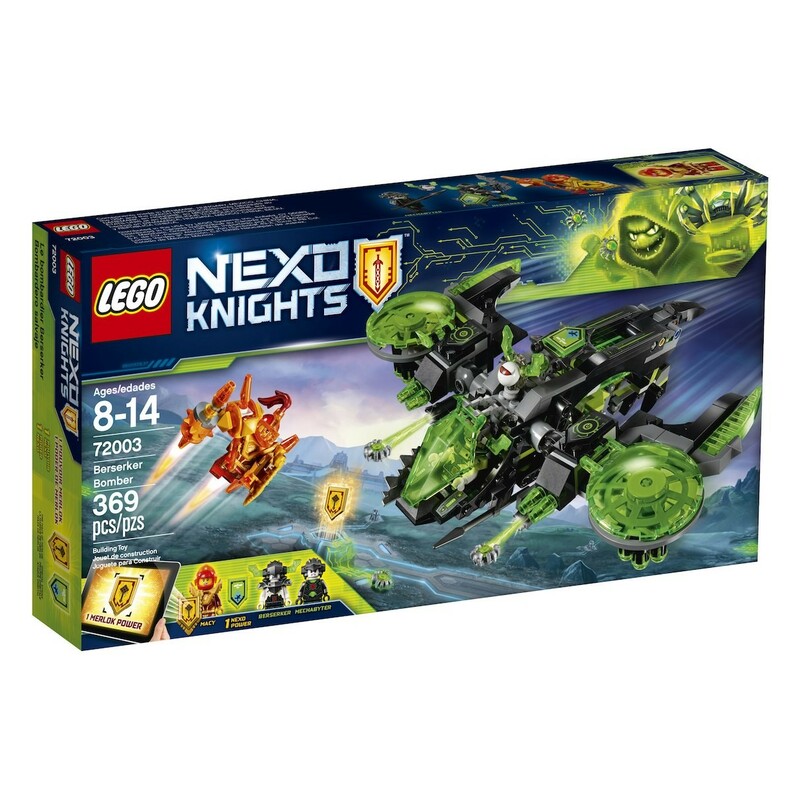 Download the free LEGO® NEXO KNIGHTS™: MERLOK 2.0 app to your smartphone or tablet. Ask your parents' permission. Scan shields for the NEXO Power Orbital Strike and Merlok Power The Mace of Merlok, and power up in the LEGO® NEXO KNIGHTS™ game! This popular kids toy is suitable for ages 8-14. Berserker Bomber measures over 3” (8cm) high, 9” (24cm) long and 8” (22cm) wide. Vyro Suit stands over 3” (9cm) high. Macy's Jet Pack measures over 2” (6cm) high, 2” (7cm) wide and 1” (5cm) deep.